Lauren and I just returned from Comic Con on Saturday. We flew out to Southern California on Wednesday and had a little vacation just the two of us. Lauren’s mom was kind enough to keep the boys. 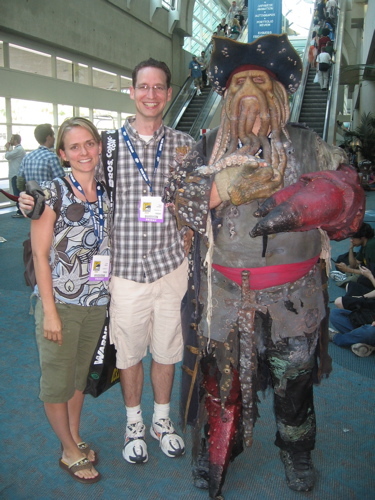 Neither of us had been to Comic Con before, and we didn’t exactly know what to expect. We knew there would be big crowds, but I don’t think we anticipated crowds THAT big. There were well over 100,000 people there, many of them in some rather elaborate costumes. Lauren and I enjoyed the ecclectic mix of people as much as we did the actual conference. Here are a few of my favorite pix. 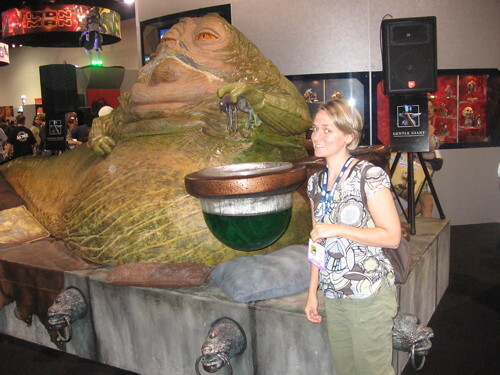 Lauren and Jabba the Hut. That’s a display, not an actual costume; no one is inside that thing. There was space for Lauren to climb up on the platform and lounge with the pillows for a better photo op, but neither of us was brave enough to suggest she do so. This was my favorite costume of the trip, even though it wasn’t the most elaborate. I’d look to assume that these guys are actually father and son, but I can’t be sure. I didn’t ask. Dr. Jones Senior even had an attache case with an umbrella stuck it in (visible at the bottom of the photo). I thought that a nice touch. 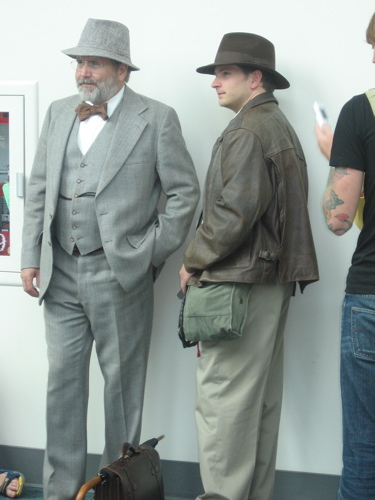 Young Indiana Jones looks very much like a friend of ours Warren Williams. In case you were wondering. There’s nothing especially interesting about this shot. 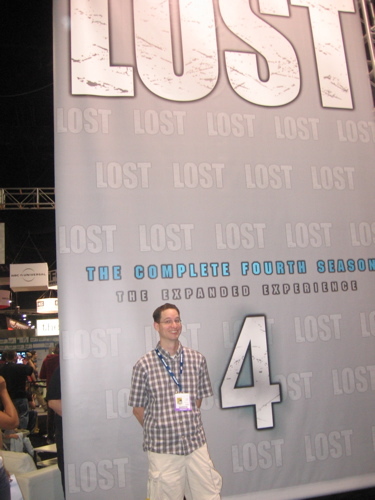 The LOST booth where this was hung turned out to be somewhat of a disappointment. I was hoping for an elaborate LOST display with cool trinkets, posters and giveaways, but no such luck. All that was there were a few couches and a flat screen TV showing one of Season Four’s episodes. I had Lauren take my picture with the banner anyway. There was, however, a cool LOST booth elsewhere on the convention floor: a Dharma Initiative booth was manned by a few DI’s in jumpsuits signing up recruits. I thought that cool, at least. I loved the recent Iron Man movie, and so I couldn’t help but snap a shot of this bad boy, the evil suit worn by Jeff Bridges in the film. A-W-E-S-O-M-E! Lauren and I went to a panel on adapting comic books to screenplays. I thought it very cool. The people in the photo are (from left to right) one of the screenwriters from Iron Man (who also adapted Children of Men, one of the best science fiction films ever), the principal screenwriter from this year’s Incredible Hulk, comic book legend Stan Lee, and the moderator, some guy from Creative Screenwriting magazine. Stan Lee was incredible. Wonderfully self-effacing and absolutely hilarious. He had the crowd in stitches. A true delight. The man is a master of the craft. Seeing him was one of the highlights of the whole trip. Friday was Star Wars Day. 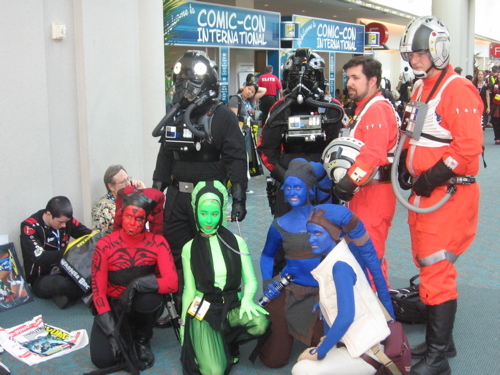 A lot of people dressed up as stormtroopers or scantily clad Princess Leahs. This group was one of my favorites. All the women were those go go dancers from Jabba’s palace, and the men were all pilots. A few of them didn’t look like they could fit in an X-wing, but hey, it’s all in good fun, right? 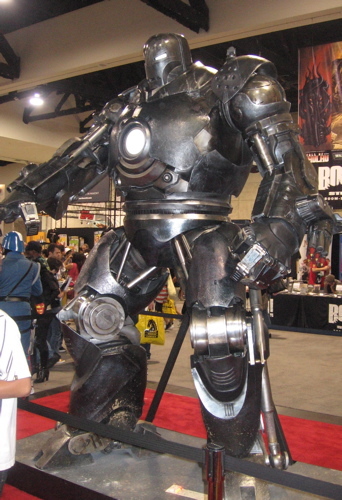 This guy’s costume was just downright amazing. I couldn’t tell if he had made it himself or stolen it right off the studio lot. Very realistic. We took this picture toward the end of the day and you would think that a guy like this would be sweaty and smelly after wearing this all day. Surprisingly though, the man smelled liked fancy cologne. And not too much of it either — proving once and for all that even evil undead half-human/half-octopus sea monsters can practice good hygiene. Perhaps the best part of Comic Con was seeing old friends. Lauren and I had dinner with the Cards, which was great. 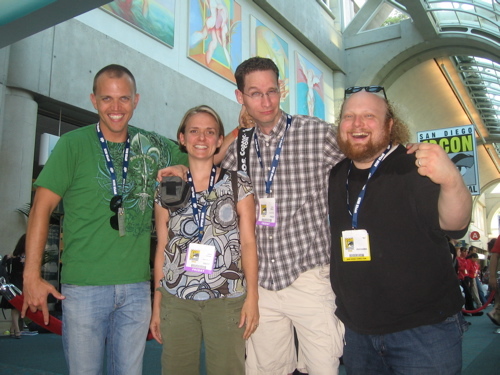 And we saw two of our dearest friends from LA, Dagen Merrill and Chris Wyatt (pictured here), who had come to Comic Con to pitch a comic idea they had.